The Photosmart B8550 is ideal for photo enthusiasts and hobbyists who want to make 13″ x 19″ prints with ease. 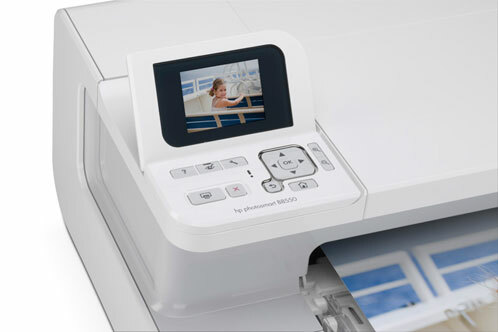 The B8550 produces vibrant prints and offers a very straightforward, easy to operate interface. Professionals and advanced users might want to consider other options because the printer does lack some of the more advanced features of higher-end printers such as advanced ICC profiles (there are some basic ones), and a wider range of color and black cartridges. The Photosmart B8550 is a reasonable sized printer and has a footprint of about 26.5″ x 16.9″ x 9.5.” Setting the printer up took about 20-30 minutes, with most of that time being the initialization process of the ink cartridges. Between the instructions on the 2.4″ LCD and the provided step-by-step startup guide, the setup is very easy. Once the ink is installed, the printer even does its own alignment without you having to input anything. My only personal complaint with the install is when you install the printer, you have to install all of the Photosmart software along with it. Some of these, like the Device Manger and Dashboard ink status widget, are useful, while others are very redundant and basic if you already have photo managing or editing software. This software might be useful if you don’t have anything for photos, but a custom software installation option would have been nice. Prints from the Photosmart B8550 were outstanding. The printer does an excellent job of handling tonal gradations and providing excellent clarity in the images. Additionally, HP’s Vivera inks provided very vivid colors on everything from 4″ x 6″ prints up to 13″ x 19.” Prints dry almost immediately to the touch after coming out of the printer, but they look best after sitting a few minutes and letting the ink settle into the paper. Printing time is very reasonable even at the best quality. On average, it took the printer about 1:30 for a 4″ x 6″ print, 2:30 for an 8″ x 10″ print, and 5:50 for a 13″ x 19″ print. These are with the printer at the highest quality, and times were definitely better at the normal setting. Advanced users have the option to let their preferred application manage the colors using the provided ICC profiles from HP. Beginning users can let the printer manage the colors and tweak the output as they desire. One thing I noticed when letting the printer manage the colors: the images tended to be a little darker than what I personally preferred. The other thing to note is areas of prints with a lot of very dark shadows tended to have a slight green cast to them, whereas the rest of the picture looked normal. 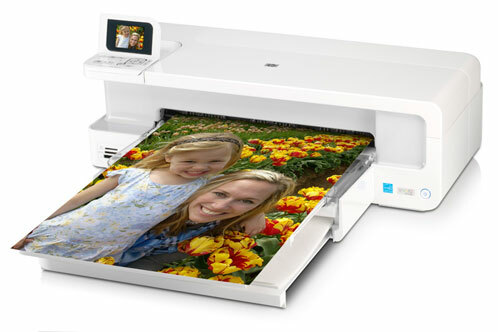 The printer also offers the ability to print directly from a memory card, camera or USB storage device. A nice little side note is you can use the printer’s memory card slot as a card reader for your computer if you don’t already have one. Printing directly from a memory card was very easy and offered fifteen print layouts for various different paper size/print combinations (for example: 2 5″ x 7″ prints on an 8.5″ x 11″ page). There are also options for things like album pages, cropping, adding frames and special effects. I personally preferred working directly from the computer, but I can see direct printing being very useful for quick prints. An inherent trait in a lot of entry-level printers is they tend to consume a massive amount of ink. From my experience, this was definitely the case when using the Best quality setting. After about a dozen prints on the best quality setting (a mix of mostly 8″ x 10″ and 13″ x 19″), the yellow and photo black cartridge were giving a low ink warning. Interestingly enough, both magenta and cyan had at least 75% of their capacity left. Ink consumption improves quite a bit when printing on the normal setting, and I honestly could not see a drastic difference between a best and normal print at a reasonable viewing distance. The one caveat here is I could only select normal when letting the printer manage the colors. When letting Photoshop manage the colors, only the best and max DPI settings were available. I’m not sure if this is only limited to Photoshop but should be noted. As I had mentioned earlier in my review, the HP Photosmart B8550 is an excellent printer for photo hobbyists and enthusiasts. It’s a great choice if you enjoy photo projects like calendars, scrapbooks, etc. 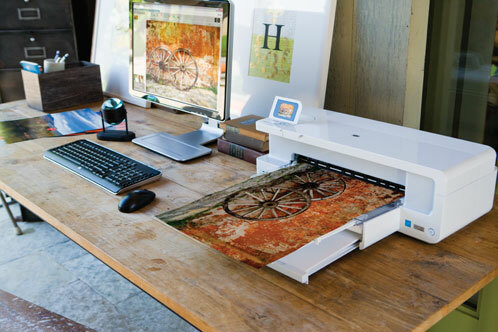 HP has a whole set of free photo printing projects at the HP Creative Studio. Like most entry to mid-range printers, it does tend to eat ink at the highest quality setting. My advice for potential buyers would be to look into the larger capacity inks that HP offers, which tend to only be about $5 more than the regular cartridges ($15 vs $10). The quality of the prints and potential print sizes make it a great value for the money. The HP Photosmart B8550 Inkjet Photo Printer is available from Amazon.com for about $220.